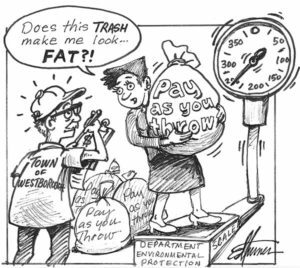 Westborough – According to the Department of Environmental Protection, Westborough has one of the highest rates of trash tonnage per household in central Massachusetts. To help alleviate this problem, a committee, using a grant obtained by the Board of Health, was formed to research and come up with viable options for residents. All Westborough residents are encouraged to use the recycling facility at E.L. Harvey & Sons even if they have curbside pickup for their trash. Paper, metal and plastics can now be comingled into the same recycling container. Only cardboard and glass need to be separated out into their appropriate containers. And as of Sunday, July 1, the Westborough transfer station will no longer accept construction or demolition debris. Officials hope this measure will cut down on the overall quantity of trash being produced and attributed to the town.